Department of Art Lecture Series- Janet Echelman: "Reshaping Public Space"
Janet Echelman builds soft, billowing sculpture at the scale of buildings that respond to the forces of nature- wind, water, and light. She combines ancient craft with cutting-edge technology to create ultra-lightweight sculptures that move gently with the wind in ever-changing patterns. Her art becomes an inviting focal point for civic life and shifts from being an object you look at, to something you can get lost in. 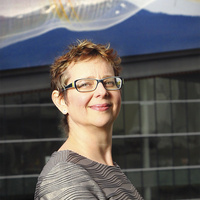 Recent prominent works include: Skies Painted with Unnumbered Sparks, a 745-ft sculpture that premiered at the 2014 TED Conference; Water Sky Garden, a commission for the 2010 Vancouver Winter Olympics; She Changes on the waterfront in Porto, Portugal; and Every Beating Second in San Francisco Airport's new Terminal Two. A recipient of the Guggenheim Fellowship, Echelman was named a 2012 Architectural Digest Innovator for “changing the very essence of urban spaces.” Her TED talk Taking Imagination Seriously has been translated into 34 languages and has been viewed by more than a million people worldwide. Please join us for a pre-lecture public opening reception from 4:30- 5:30 p.m. at the Matthew Knight Arena for Janet Echelman’s Allegory, 2014, the newest artwork to join Oregon’s Art Collection, which is owned by the University on behalf of the State of Oregon. The work was commissioned by a panel of University representatives and the Matthew Knight Arena design team working with the Oregon Arts Commission.